VIRGINIA BEACH, Virginia - BLACKHAWK products are relied on and revered by top tier law enforcement and military personnel around the world. BLACKHAWK has spent the past several years, behind closed doors in their Bozeman, Montana facility, taking their attention to detail and quality engineering to an even higher level to create the ultimate line of duty-rated holsters - the T-Series. The T-Series is the next evolution of BLACKHAWK’s Master Grip Principle. The Master Grip Principle provides a critical benefit for end users because it compliments intuition; the user will never have to re-learn how to use their equipment. As the user naturally reaches down to draw on the holster their hand lands exactly where it should to deploy their side arm. With its streamlined thumb-activated retention, the T-Series keeps your firearm at the ready while maintaining total security. The low-friction, dual-density internal material makes for a smooth and effortless draw while the exterior provides high-durability with a proprietary glass reinforced nylon and soft touch polymer liner. This durable material provides protection with a sleek design for minimal bulk. Available in Level 2 or Level 3 configurations, there’s a fit for any need. 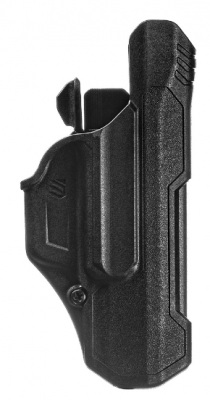 This new line of holsters is just the beginning of the anticipated innovations to come out of BLACKHAWK this year; there are plans to release compact, light-bearing, and RMR compatible versions of the T-Series. This and many other BLACKHAWK products are proudly designed and manufactured in the USA. In 1990, a Navy SEAL was navigating a minefield when his pack failed. As his gear tumbled to the ground he vowed that if he got out of there alive he would make gear the right way. Today, this obsession with quality applies to everything we do. We’re constantly researching, refining and perfecting every detail to provide gear that won’t let you down. Because we’re not just making stuff. We’re honoring a vow.